This one is probably for people who are reasonably comfortable making bread already, as there’s some discretion involved. Because everyone’s side dishes are different, you’ll need to judge how wet the dough is and add more liquid or flour accordingly. 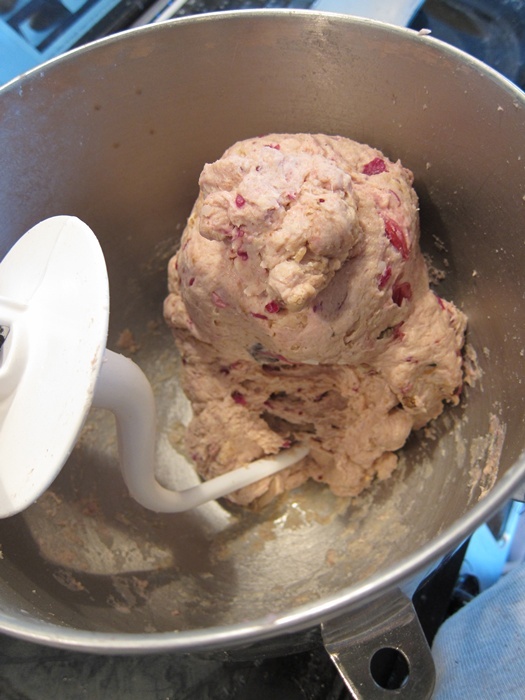 I used some fairly dry stuffing and some pretty moist cranberry salsa, which, combined with mashed potatoes, balanced out well for a really tasty bread! 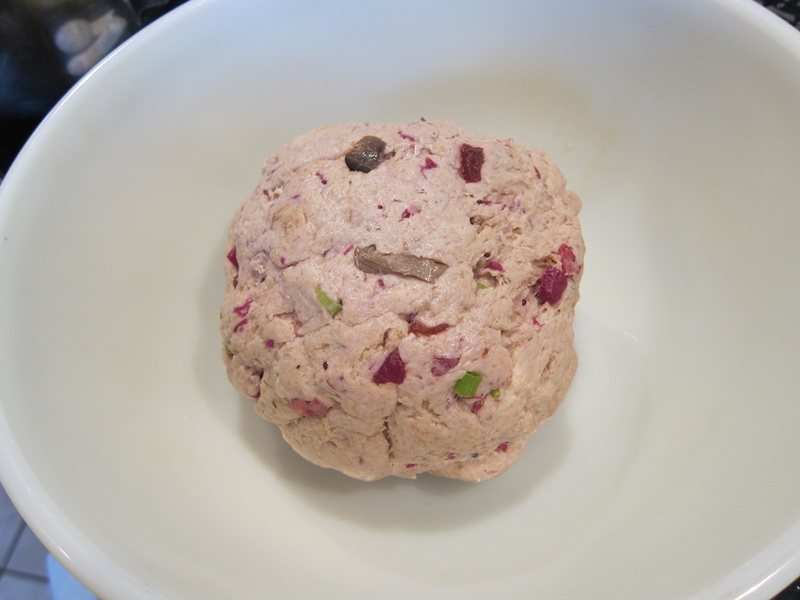 In a large bowl, add the warm milk, yeast, and sugar, and let sit while you gather the remaining ingredients. Add the butter, 1 teaspoon salt, and flours. 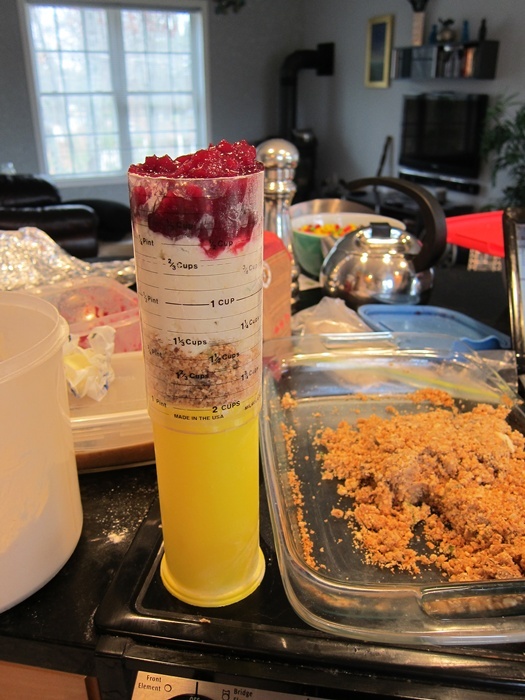 Add your two cups of leftovers. Stir together and taste a tiny bit to see if it needs a bit more salt. Knead until smooth. At this point the dough should be tacky, but not super sticky. It should be able to hold its shape. If it’s too moist, add more bread flour 1/4 cup at a time, and if it’s too dry to hold together, add water or more milk 1 tablespoon at a time. Form into a ball and place in a greased bowl. 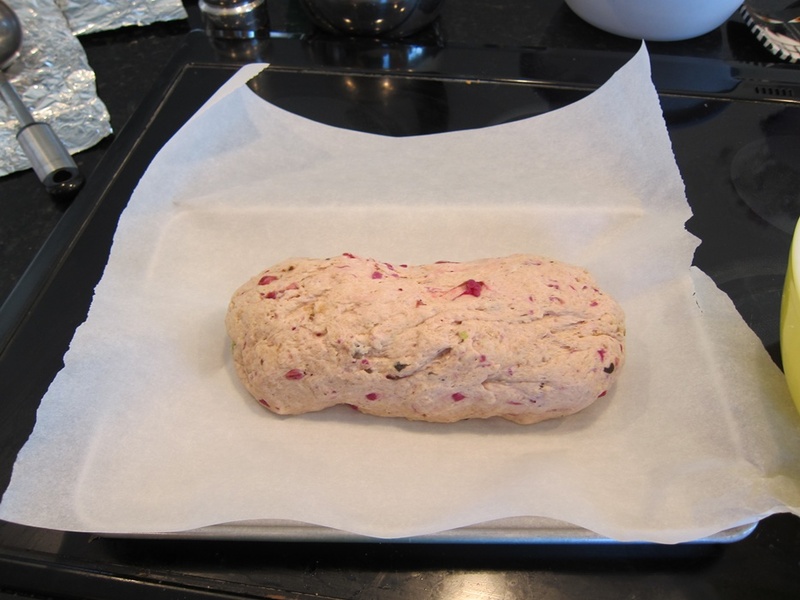 Cover, and let rise until puffy, 60-90 minutes. Mushrooms from the stuffing and green onion from the cranberry salsa. Gently deflate, then shape into a log about a foot long. Place on a parchment lined sheet, and cover. Let rise another 60-90 minutes. Preheat the oven to 350 degrees, and bake 35-45 minutes, until golden brown (which may be harder to tell if you put strongly colored leftovers in), or is 190 degrees on an instant read thermometer inserted in the middle. Transfer to a wire rack, and let cool completely before cutting. With such a moist dough, it can get gummy if you start cutting while it’s still warm. 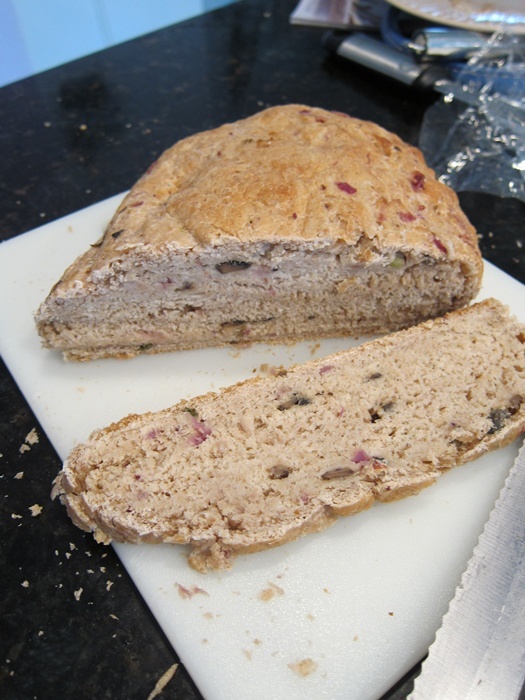 This is a great bread to make sandwiches with the rest of your leftovers with! 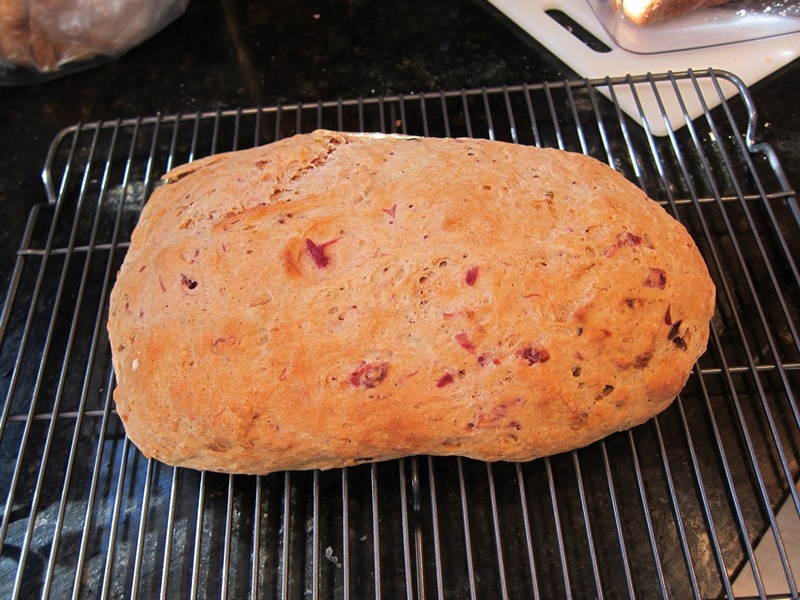 I might try it in a bread pan, with a few more minutes baking time, next time. I’ll be submitting this one to YeastSpotting. Mm, fried mashed potato balls! In a large bowl, add the warm milk, yeast, and sugar, and let sit while you gather the remaining ingredients. Add the butter, 1 teaspoon salt, flours, and leftovers. Stir together and taste a tiny bit to see if it needs a bit more salt. Knead until smooth and tacky, but not overly sticky. 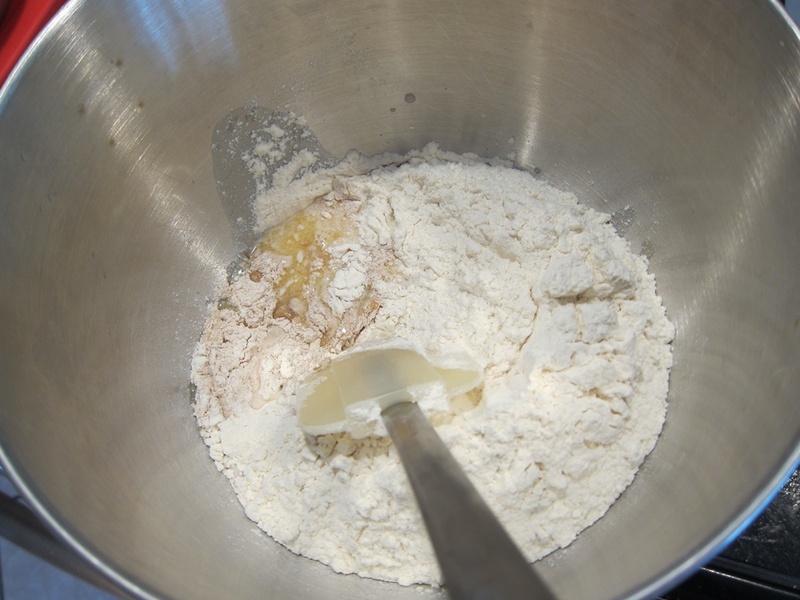 If the dough is too moist, add more bread flour 1/4 cup at a time, and if it’s too dry to hold together, add water or more milk 1 tablespoon at a time. Form into a ball and place in a greased bowl. 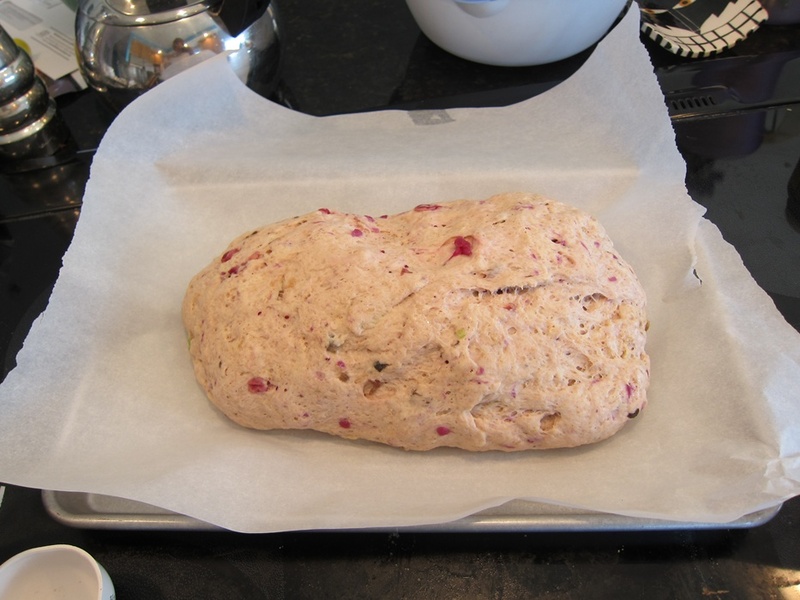 Cover, and let rise until puffy, 60-90 minutes. Preheat the oven to 350 degrees, and bake 35-45 minutes, until golden brown (which may be harder to tell if you put strongly colored leftovers in), or is 190 degrees on an instant read thermometer inserted in the middle. Transfer to a wire rack, and let cool completely before cutting. 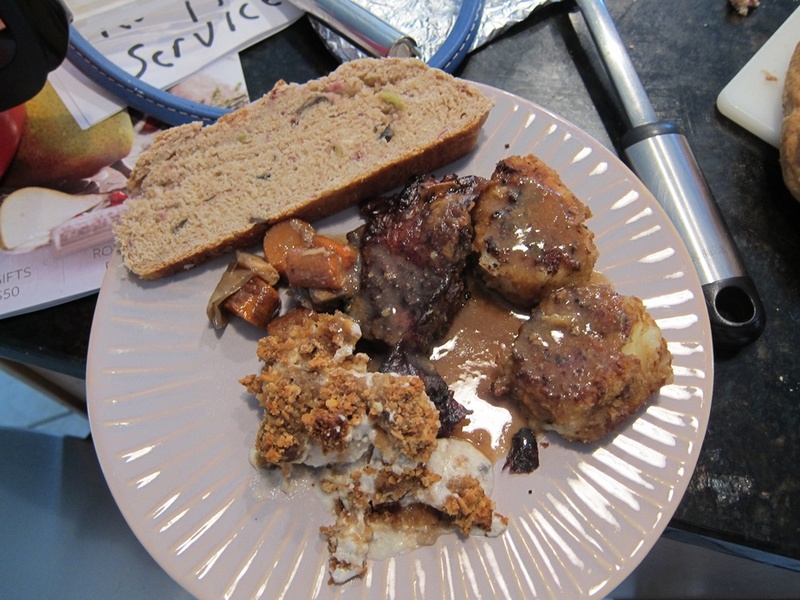 This entry was posted in Bread and tagged Bread, cranberry sauce, leftovers, mashed potatoes, stuffing, Thanksgiving, Thanksgiving bread. Bookmark the permalink. That’s a completely hilarious and awesome idea. I love it. Gotta use up the rest of the leftovers somehow once the turkey’s been made into soup!